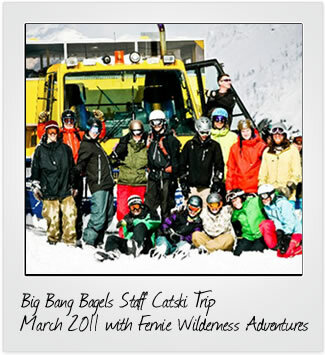 Welcome to Big Bang Bagels, a bagel company in Fernie, British Columbia, owned operated and run by Fernie Locals, serving Fernie and the Greater Fernie Area with fresh baked Fernie style bagels. Here at Big Bang Bagels, we make our bagels from scratch. We combine wholesome and healthy ingredients, hand rolling each bagel, then boiling them to perfection before baking these quality bagels. 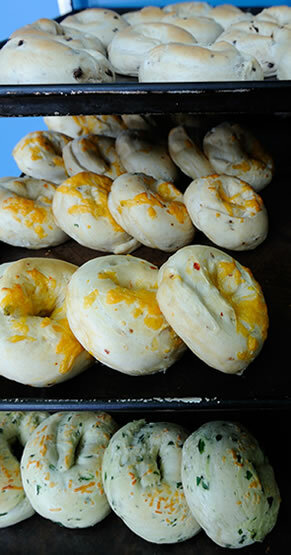 Big Bang Bagels is proud of the care that goes into each bagel, and happy to provide you with highest quality bagel available in the Greater Fernie Area and Universe (according to some). So if you haven’t tried a Big Bang Bagel yet…. What’s stopping you? Pop into our small bakery open everyday from 7am to 5pm. We’re located at 502 2nd Ave or you can pre-order your bagels by calling 250.423.7778. Can’t wait to feed you soon, until then keep healthy and happy.